LED waterfall faucets might sound a bit gimmicky, but HomeThangs.com has introduced a guide to how this sleek, ultramodern look can be an eye-catching accent for a contemporary bathroom. Adding a simple LED light to a clear glass or plastic piece allows it to have its own personality outside a coordinating sink, with a soft, lovely glow that’s pleasantly eye catching without being overly conspicuous. LED faucets often err on the side of being gimmicky, but on a really unique, unusual faucet, built in lights can really bring the design together. Modern waterfall faucets in particular benefit from added LED lights, mostly because they play up the futuristic aspect of the style. HomeThangs.com has introduced a guide to a few of the most unique and eye-catching combinations. Even fairly simple waterfall faucets with fairly standard designs benefit from having built in lights. The reason for this is simple: even on the most ordinary, faucet-looking waterfall faucets, the point where the water spills out of the faucet and into the sink is more visible than it is on a traditional faucet. This both amplifies the appearance of the light and draws attention to the most unique aspect of a waterfall faucet: where the “waterfall” itself forms. Some of the more unusual waterfall faucets – particularly those designed to be paired with glass vessel sinks – are designed with transparent plastic or glass parts, and here again LED lights really shine. 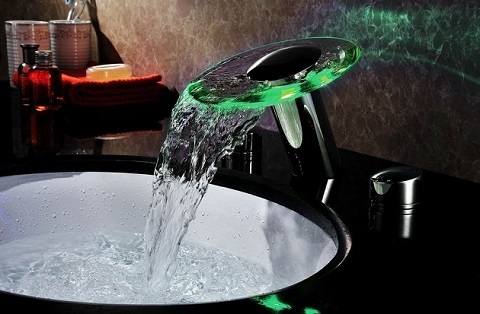 Rather than simply illuminating the water, these lights light up the whole faucet, giving them a soft, colorful glow. On some more complicated faucets, the lights can even draw attention to the unique shapes of the faucet head, creating a very distinctive look that couldn’t be accomplished with metal and water alone. 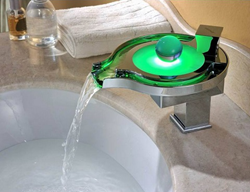 For a closer look at more LED waterfall faucet designs, check out the full article here.